Wish you could ice skate or get a hockey game going right in your very own backyard? 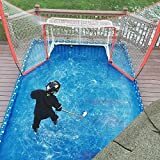 Then check out this cool new EZ ICE Backyard Rink Kit. It includes everything you need, minus water, to quickly and easily set up a 20' x 40' ice rink on any hard or soft surface like frozen ground, soft grass, driveways, pavement, or even tennis or basketball courts in only 60 minutes. 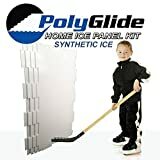 Best of all, no tools are required to set it up, because a simple strap system replaces the need for hammering stakes into the frozen ground like with other backyard rinks. Just slip the 24 expertly engineered 16" tall boards together with the 28 brackets and straps, lay down the liner, fill with water from the hose, and wait for it to freeze. It's self-standing and self-stabilizing, designed to be expandable in size in the future, and will not damage the underlying surface. Check out this video to see it in action. Cool huh?